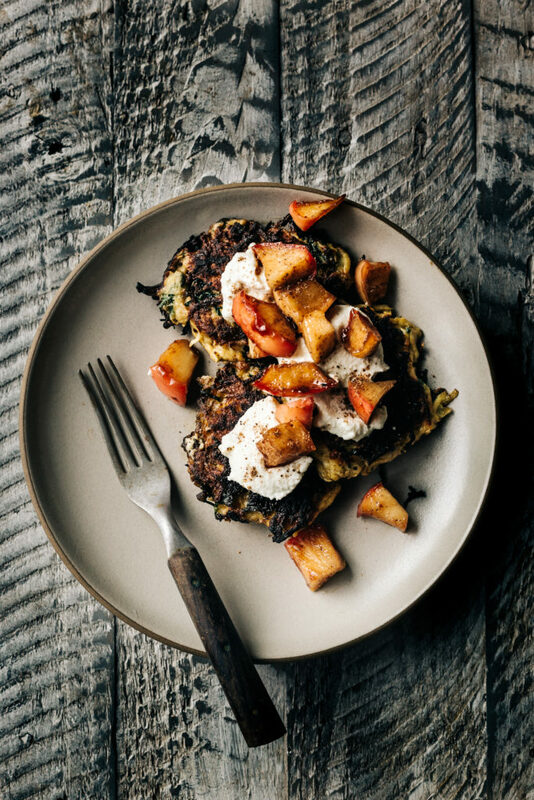 Rutabaga fritters with spiced apple compote and cashew cream…Hell yes! Taylor and I made these fritters three weeks ago after a particularly cold and wet day at the farm. After warming up with a hot shower and clean clothes we decided that dinner would be “snacks” instead of a full meal. These fritters were a total hit and with Thanksgiving just around the corner I can’t help but share these with you all. Between the cashew cream and spiced apple compote this appetizer is what autumn is all about! This recipe is a great way to use one of our favorite root veggies (the mighty rutabaga!) and will be a great addition to your holiday dinner spread or happy hour snack menu. Serve with your favorite beverage and good company and you’re all set! Place apples and water in a medium saucepan and stir over medium-high heat until the mixture is bubbling. Reduce the heat to low and cover. Continue to cook, stirring often, until the apples have cooked down but still have some texture, about 15 minutes. Add maple syrup, lemon juice spices and vanilla. Cover and cook for 5 minutes longer. Remove from heat and set aside. Place all the ingredients for the cashew cream in a high speed blender. Whirl away until smooth and creamy. Taste test and add additional water to thin if necessary. Grate your rutabaga and potato on the large holes of a box grater or with the grating attachment on your food processor. Transfer to a dish towel and ring out excess moisture before adding the veggies to a large bowl. Stir in the leek, parsley, salt, flour and eggs. Mix until well combined. Heat the oil in a large skillet over medium-high heat. Working in batches, spoon small scoops of the mixture into the skillet. Cook until golden brown and crisp, about 3 minutes per side. Serve fritters with the cashew sauce and spiced apple compote. Hi Andrea! I made these for appetizers for Christmas and everyone LOVED them. Thank you for such an awesome recipe! Also, a leaf of sage accidentally made its way into the apple compote. I tried it, and it was delicious!! Would definitely recommend if you make it again:) happy holidays! So happy you loved it! Happy cooking! And great tip about the sage! !